I am so sorry for my lack of blogging this week! I don't know what came over me but it seemed my mojo had run dry. I went into the craft room Monday only to find that every layout I made an attempt at came out looking horrid. To top it all off - I was having a huge run of bad luck. My glue dot runner broke which left me only my ATG gun. My ATG gun is running VERY low on adhesive. To put it lightly, I am quite screwed in the adhesive department. Thank goodness my luck turned around on Tuesday. I was able to make this layout. While it isn't my favorite - it is much more decent then the trash that was coming out of the craft room on Monday. 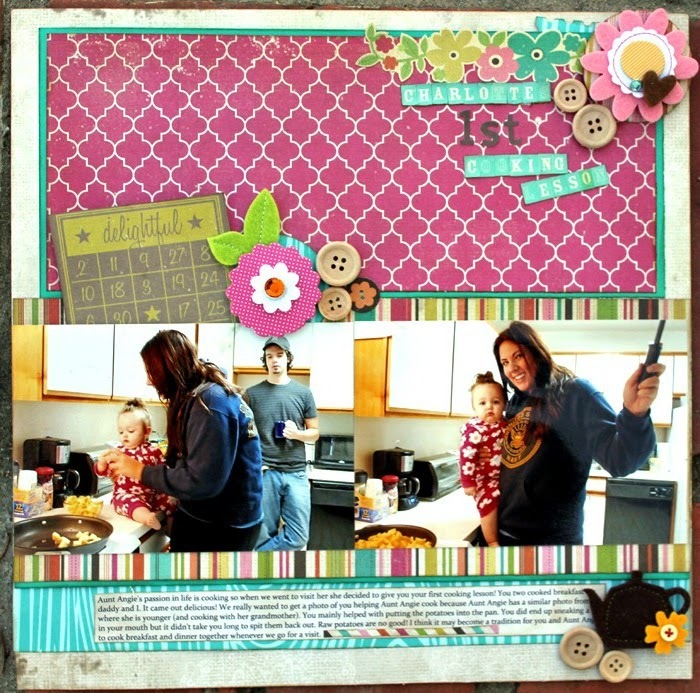 The layout mainly features papers from Simple Stories' Fabulous collection. The teal wood grain paper is by Bella Blvd. The photos are of my daughter helping her godmother cook breakfast. 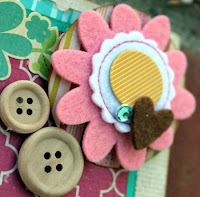 The wooden buttons and felt pieces are from American Crafts. The alpha stickers for the word "1st" are from My Little Shoebox. HELPFUL TIP! If you are like me and find it impossible to get your mini alphas properly lined up AND you like for them to be inked around the edges - this tip may help you! I lined them up close to the edge of a scrap sheet of paper, cut them out as a whole, and inked the edges. Voila! They were much easier to play around with on the layout. On another note...the above came in the mail yesterday. I have no excuse not to scrap the photos from the day my daughter was born now! After searching high and low - I found the collection PERFECT for the photos (despite it being a much older collection). Now I just need to DO IT. These are my most prized photos, though. They are so very special to me. I am having a very hard time coming to terms with scrapping them because I just want the layout to be as perfect as it possibly can be. Does anyone else have photos that you just find hard to scrapbook because of how much they mean to you? 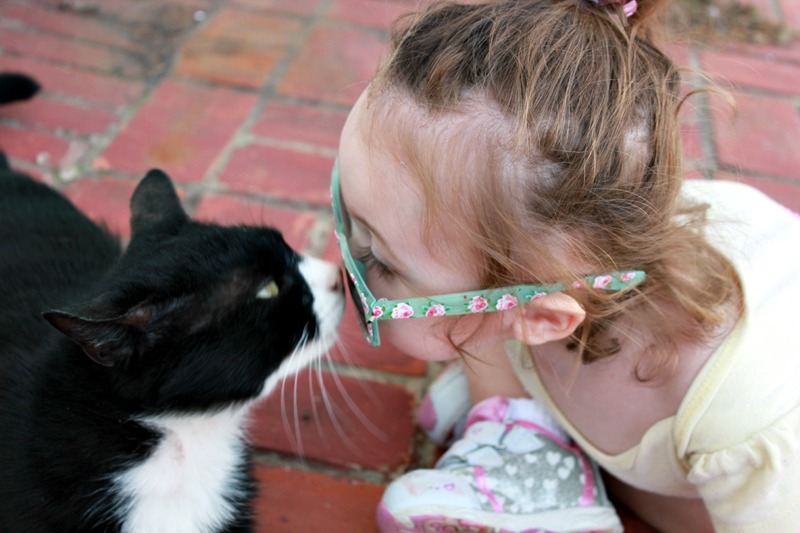 ...And just because I've decided that everyone could use a little cuteness in their lives today, I'll leave you with this picture of my daughter and one of our beloved kitties (Matrix). Ahhhh.... I know that feeling...I have two sets of layout stuff all over my work table, but nothing seems to be coming together. I think this one turned out cute. 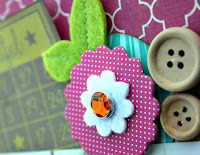 Love the felties! TFS! great layout! love all the bright colors!! LOVE this layout! I love all the embellishments on there!! It always stinks when adhesive runs low-- no good. And the pic of your daughter and Matrix is adorable! Fun post! AND, great layout - love that tip about the letters!!!! 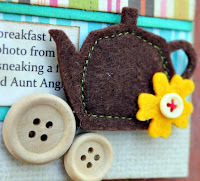 Very pretty layout and great embellishing! I am running low in the adhesive department, too! I know what you mean about scrapping the "favorite" photos. I actually usually get doubles and just scrap one set. But leave the others for framing or a little brag book. That last photo is just darling. Thanks for the smiles! Thanks for the tip! I use small letters a lot and it's a pain to line them up. What I do now is to line them on and sticking just the end to an acrylic ruler. 2 Benefits to this, first they're aligned, and I know exactly where to start my letter. I'll have to try your tip too. Aww the first born photos are so special. Luckily I scrapped those before I knew anything about scrapbooking. 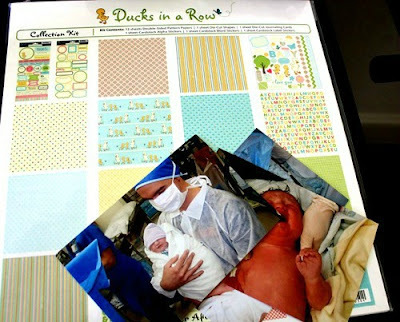 So those photos were scrapped 4x6 whole with simple matting and a title and a journaling. I love them though, and I actually like that there's no embellishment on those pages. I did have a more difficult time scraping the hostpial bracelets. I wanted to scrap all 3 bracelets (baby, mom and dad) on the same page and it's hard to arrange them nicely. I scrapped that page twice but still didn't like it. I'm gonna let it go and leave it as is though. Nobody else cares haha! Love the stashes & the layout is great too! Seriously love the layout and the tip about Tiny Alphas! I am going to have to totally use that one! And the pic of your daughter and the cat is ADORABLE! I'm waiting to see that one scrapped! I think it needs to be like a 5x7! 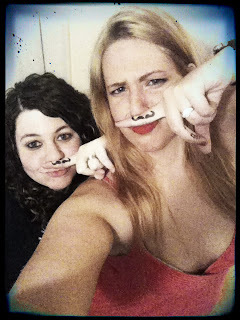 Adorable daughter, adorable layout and cute mustachioed girlies! I know how you feel about not having good ideas or quality scrapping coming out of the workroom. Been there too many times. But hey, girlfriends come at just the right time and lift our spirits. Looks like you had a blast! Excellent layout, I think it looks wonderful. And the photo of your daughter is absolutely adorable.